The ONT is generally located indoors, and must be adjacent to a power outlet. In some cases it’s placed in a box on the outside of the home. 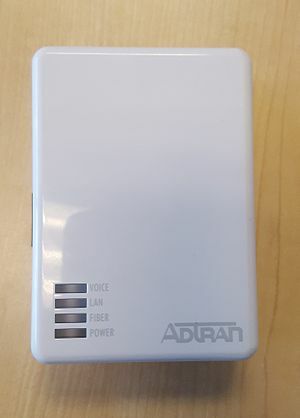 The ONT is an Adtran 411 which serves as a modem by providing Gigabit Ethernet as well as a POTS phone jack. Power – This LED verifies power is getting to the device. Fiber – This light will remain solid green while the connection between the ONT and Sonic is established. If the light is off, the ONT is not making the connection. If the LED is switching from green to red, then light levels are far below what they should be. 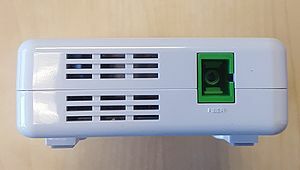 LAN – The LAN light will blink to signal an active connection. Voice – This indicator will go solid green when the voice line is in use. 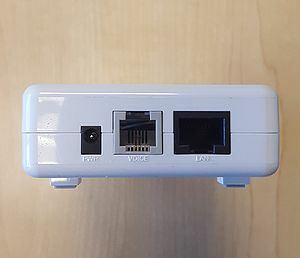 One side of the ONT has a 12V Power port, an RJ-11 port for VoIP service, and a Gigabit Ethernet port, as shown in the image below. If you ever have connection problems, a good troubleshooting step is to unplug the power cable from the side of the ONT for a full 15 seconds and then plug it back in. Allow a few minutes to reboot. 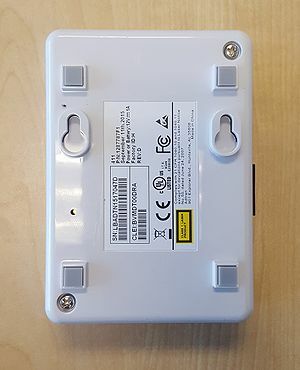 The other side of the ONT contains the Fiber connection and should not be unplugged, as dust can get into the port and cause connection issues.